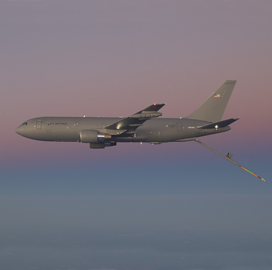 Boeing (NYSE: BA) has received a $2.85B contract modification to produce an additional 18 KC-46 aircraft designed to support the U.S. Air Force‘s aerial refueling missions. The company said Monday the lot 4 tanker production contract also covers the provision of two spare engines, five wing refueling pod kits and initial spares. Work will take place at a company facility in Washington through January 2022, the Defense Department announced Monday. The first and second production lots for KC-46s were awarded to Boeing in August 2016 and the third one in January of last year. The latest award will bring the number of tankers ordered by the service branch to 52. The company aims to build a total of 179 refueling aircraft units for the Air Force fleet. Deliveries of the tanker aircraft could begin later this year. Boeing has obtained a supplemental type certificate from the Federal Aviation Administration for the KC-46 after conducting a three-year assessment of the tanker’s boom and drogue systems for aerial refueling missions.